Christmas in Japan has taken on unexpected meaning for us. 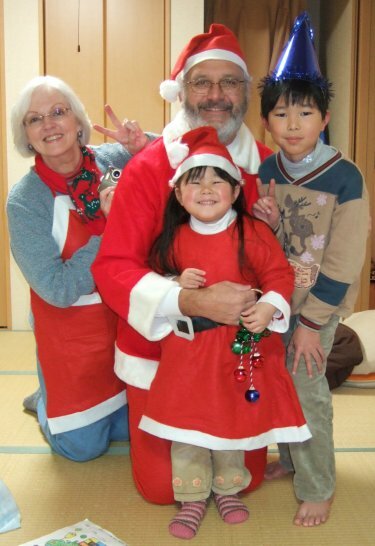 Each year since coming to Koriyama Chas has played “Santa san” (Santa Claus) for two very sweet Japanese children. Rio and Souta are the children of a co-worker. We first met them at ages 3 and 7 when Santa san was a special Christmas Eve visitor. Now age 5 and 9 respectively, these children have become a significant part of our lives. Last Christmas, our second with the Gunji family, came and went without writing a story. 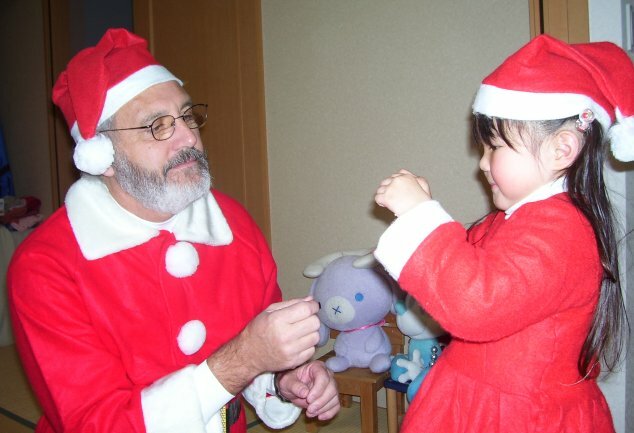 Now, as we contemplate our third Christmas in Japan; I am anticipating our Santa gig and looking forward to seeing how the children have grown and what their relationship with Santa will be this year. The first Christmas was a huge surprise. Rio, the 3 year old princess, was a little shy. She warmed up to all the candy quickly enough, and she delighted us with her ability to hold two golf ball sized strawberries in her mouth at the same time. Souta was clearly mom’s helper and dad’s little tough guy. He loved to play, and he was very curious about Santa’s beard. We were enchanted with the evening and with the children. The second Christmas found the children more than ready for us. Eight year old Souta looked slightly skeptical of the big guy in the red suit, especially having accidently bumped into a casually dressed Santa jogging in the park last summer, but he played along gamely. Four year old Rio had found her stage. Dressed in a red “Santa” suit of her own, she frequently showed off her dress and compared it to the attire worn by Santa san. Once again, we were treated to a wonderful dinner and a warm family evening. However, there was something even more special to the evening for me. Last October I had surgery on my back in Tucson. It was a long recovery and I arrived back in Koriyama just 10 days before Christmas. Chas had something special waiting for me. Souta had folded 5 tiny origami cranes for me, and Rio had drawn pictures and made a paper dragonfly to speed my recovery. Both children wrote notes to Mrs. Santa. Of course, I cried. Duhhhh… Believe me, I will treasure the cranes and the dragonfly the rest of my life. Since my surgery Rio, Souta, and Mrs. Santa have carried on an occasional correspondence, exchanging notes and drawings. Santa occasionally sends small gifts from the Arizona branch of the North Pole. It is a good thing they are children and still writing in hiragana and katakana (the two, relatively simple, Japanese syllabaries). I guess pre-school is about my level, because I seem to be able to read Rio’s notes. I felt pretty good about being able to communicate with my 4 year old pen pal. I have frequently joked that my ability to read and write Japanese is about that of a preschooler; but, WOW, Rio is probably starting kindergarten soon. She will quickly surpass Mrs. Santa. I wonder what she thinks about Santa and Mrs. Claus and their lack of facility with Japanese. I hope that her parents have made up something good, because Mrs. Santa is still taking baby steps in learning the Japanese language.